A sharp-tongued magpie if ever there was one, the Scorpio born in a Rat year will be chatty and cutting. This person is generally lithe and agile as well as quick-spirited. He or she will probably enjoy all manner of graceful sport and prove able at competitive games. 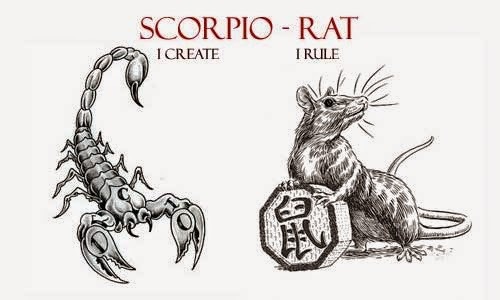 The Scorpio/Rat is an amiable fellow. People like him or her straightaway and never guess that behind the ready smile is a rare drive for power. She does not necessarily want to rule others, but she does want to hold a potent place in whatever area she has chosen as her own. The Scorpio Rat has a strong character. She is not namby-pamby and knows precisely what she wants out of life. With the sneaky old Scorpio to temper her aggressiveness, this person will be more reserved than the average Rat. She will surely enjoy receiving visitors and entertaining them generously. The Scorpio Rat is often gregarious for her own interests, but her charm is that she does not hide this fact. She's not afraid to admit that she’s out for herself and those she loves and that she intends to protect them by any means available. One of the most striking traits of this person’s character is her vision and sense of the future. She is an excellent critic of things both artistic and political, and seems to have a sixth sense about what will be popular and well liked in years to come. The Scorpio/Rat is more than intelligent. The Scorpio Rat is wily and clever and full of guile. If she puts this cunning to good use as a creator or protector, the Scorpio Rat’s fate will be felicitous. She' s a caring and understanding creature and can do much good for humankind. If, however, she is tempted by underhandedness, disaster may strike. The Scorpio/Rat is more vulnerable to disapproval than she seems. This is basically a noble nature that on the whole wants no ill to befall others. She is both nervous and suspicious, so she worries a lot and may suffer from anxiety attacks. She is magnetic and projects a pleasant presence. She will not take kindly to the meddling of others but can be accused of meddlesomeness herself. Scorpio Rat enjoys judging others and is adept at pinning them down to fine points or nailing them on delicate subjects. This person can make herself very unpopular with adversaries if she is not ever so careful on whom she passes her hasty judgments. The creative side of Scorpio/Rat is frequently scotched by her need to compete and win. She does not handle failure well. He or she can be leveled by setbacks and will give up anything and move to the country if the establishment gets in the way. Finally, the Scorpio Rat is quite sufficient unto herself. Although she persists in wanting to shine against the foil of competition and to triumph over those she considers her opponents, if she will learn to sit back and take stock, to quiet down and examine her problems calmly, she may be surprised to note that she does not need to pit himself against the opposition in order to prove his worth. It’s obvious anyway. The Scorpio/Rat is a hatcher of complex romantic plots. He or she will not be attracted for long to any fly-by-night lover. Scorpios born Rat must find the person they finally settle down with exceptional. They are extremely sensual and preoccupied by passion early in their lives. Yet as they know themselves to be tempted by conquest, they often decide to marry homebody types whose very seriousness keeps the Scorpio/Rat on the straight and narrow. You may not often hear about the spouses of these busy, sometimes treacherous, souls. That’s because the ideal Scorpio/Rat mate keeps the home fires burning. Rats born in Scorpio are strong-willed. They like their surroundings to say something about them, show off their achievements, be identifiably theirs and no one else’s. Many Scorpio/Rat interiors are sleekly ultramodern. This subject is forward-thinking and always imagines herself in the avant-garde. Too, Rats born in Scorpio are creative and will tend to display their works to best advantage at home. The Scorpio/Rat parent is reliable and protective of the brood. This person never forgets to be prepared for any eventuality or emergency. As kids are the soul of the impromptu, the spontaneous Scorpio/Rat is often Johnny-on-the-spot when Junior needs a map of Venus for school the next day and it’s already past midnight. Scorpio/Rats are affectionate and communicative with their offspring. The Scorpio Rat’s ideal profession is vociferous critic. He is expert at picking apart situations that need decorticating. He or she can be canny at law or excellent at diagnosing diseases, trouble-shooting in industry or entertainment, or inventing things that demand minute attention to detail. He is of sunny disposition but will be acquisitive and hungry for power. As a boss, the Scorpio Rat will be demanding and protective, patronizing even. As he or she is very effective at any level and can handle any and all the jobs at hand, the same kind of behavior will be expected from underlings. Some careers that fit this competitive person’s nature are: fashion journalist, insurance salesman, inventor, athlete, performer, critic or politician.